Campania Itineraries Alta Valle Del Sele. The Hidden Charms of Campania’s Alta Valle Del Sele. The Upper Sele River Valley with its enchanting landscapes, the quality of its “Hundred Springs” and its splendid river, offers all its charms to anyone looking for genuine and relaxing agritourism accommodation. The historical, natural and archaeological aspects of these areas provide an ideal base for the kind of tourism that provides peace in a tranquil atmosphere for anyone seeking the values of their own being through nature. 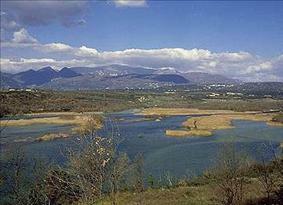 River Sele begins in Caposele, and 64 km further flows into the Gulf of Salerno, near Paestum. Its water is a source of life, and its outstanding characteristics, found in the hot springs of Contursi Terme, have meant that the Sele has been considered a natural phenomenon since the time of Virgil, who mentions it in his work. The ancients believed that its water had the power to petrify anything that fell into it, which was their interpretation of the phenomenon of natural sedimentation caused by the thermal springs, which still occurs today. The Sele is one of the most beautiful and least polluted rivers in Italy, and the valley it flows through is the perfect habitat for the otter, and birds that today can be found only in these locations. This land lies in a strategic position between Salerno, Avellino and Potenza, and between the Adriatic and Tyrrhenian seas. Nature lovers can find splendid landscapes and itineraries. Visiting these areas is like taking a journey off the beaten path into the past to discover nature, ancient traditions and excellent food: cheese, vegetables, meat, salami, olive oil, wine and honey. There are beautiful green fields, plains and mountains to see, and towns like Valva, Colliano and Quaglietta to visit. Valva lies on the slopes of Mount Marzano, dominating the area of the Valle del Sele, surrounded by the Picentini mountains. The old part of the town is very beautiful and was built in Roman times as a fortress to defend the inhabitants from Saracen invasions. Enchanting Villa d'Ayala has a medieval castle and a magnificent, 17 hectare park open to the public. The property was restored in the eighteenth century as a holiday home for the Marquis d'Ayala. The park has Italianate gardens and beautiful woods, decorated with statues and fountains. The sculptures depict myths and allegories: Diana, Spring, Summer, Hercules, painting, etc. There is also an outdoor theatre surrounded by statues. A 6-7 day tour spent in these parts will provide the chance to enjoy places and landscapes without watching the clock, and discover the treasures of this splendid area. View the agritourism accommodation in Campania.